by Ted Belue. Hardbound, 237 pages, 6" x 9". By the 1820�s, the Eastern buffalo were gone and much of its habitat radically altered. 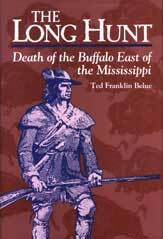 The Long Hunt is the first book to deal solely with the buffalo that once ranged from east of the Blue Ridge to theMississippi. Grim visions of the slaughter are told through the eyes of Daniel Boone, George Rogers Clark, John Donelson, Christopher Gist, Louis Joliet, George Morgan and others.